A city filled with history and culture, Arequipa, Peru, South America is an amazing destination. Its handsome features stretch across the cobblestone streets, rivers and valleys with its picturesque views and thrilling attractions. Surrounded by three volcanoes and containing the world’s deepest canyon, these natural phenomenons of earth makes Arequipa like no other city in its region. In addition, historical monuments, trendy shops, restaurants, and pristine beaches provide a plethora of activities for the adventure-seeking enthusiasts. With such a great variety of thrills, Arequipa offers its visitors the best experiences. No matter what your interests may be, your vacation will be filled with great memories that will last a lifetime. Founded in 1540, Arequipa is the second largest city in Peru. 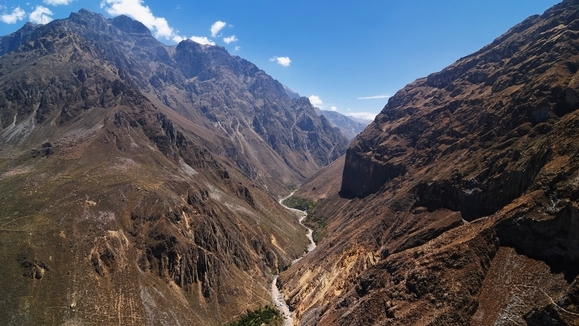 It contains three volcanoes (Misti, Chachani, and Pichu Pichu) the Colca Canyon, and River. Its nickname, The White City, comes from the fact that most of its buildings are made of a white volcanic stone called sillar. La Catedral (the Cathedral), built from sillar, is a neoclassical style monument dating back to the 17th century. It is exquisitely decorated with elaborate wood carvings and marble imported from Carrara. The Casa del Moral is also a glance into history with its unique figure carvings, antique furniture and exhibits from the Colonial and Republican periods in Peru. La Compania Church demonstrates the artistry that existed in the 16th and 17th centuries as well. Influenced by the beliefs of the Jesuits, the monument is beautifully adorned with the artistic works of celebrated artists such as Diego de la Puente and Bernardo Bitti. Along with its many architectural décor, Arequipa is also a nature lover’s haven. From climbing the great cliffs of the Colca Canyon and white water rafting along the Colca River to horse trekking across the Colca Valley, the beauty of the city’s landscape is impeccable. The city is also home to some of Peru’s most exotic creatures such as llamas, alpacas, vicuñas, and many species of birds. Amongst the historical monuments, you will find malls, boutiques, and shops filled with genuine Peruvian merchandise. Everything from fabrics and clothing made from vicuñas and alpacas, jewelry, antiques, and handicrafts are located within reach. Shoppers can cure their shopping addictions with the latest fashions and souvenirs that the city has to offer. By night, bars and restaurants become vibrant hot spots. Locals and tourists are encouraged to mix and mingle while dancing to different genres of music and drinking Peru’s trademark beers and cocktails. Arequipa’s chefs are known to produce some of Peru’s best tasting delicacies. Traditional foods will definitely light your taste buds on fire since Spanish foods are typically very hot. Foods like potatoes covered with ocopa (hot yellow pepper sauce) and chupe de camarones (a spicy soup made with potatoes, shrimp, and tomatoes) will spice up your pallets. However, for visitors who are unwilling to indulge in such zesty cuisines can feast their senses on Peruvian pizza or other international meals. During the course of a year Arequipa experiences a semi arid climate since the weather is very warm and dry. The temperature of the city averages between the high 70s during the day to the low 50s at night. Flights are available from Arequipa to other Peruvian cities such as Tacna, Cusco, and Juliaca. Buses are a very common means of travel as they provide transportation to various regions all over Peru. Taxis are also convenient because taxi drivers will take you to your exact destination (traveling across town prices range from $0.70 to $1.00).